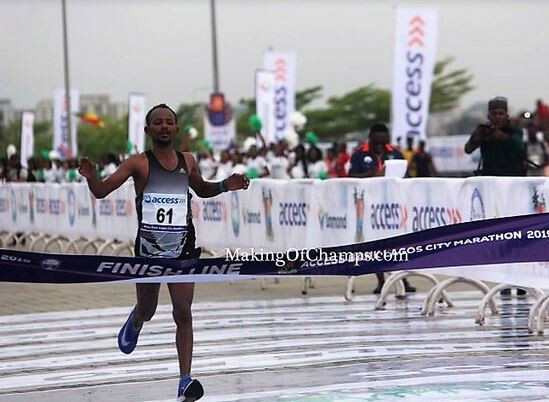 Ethiopians Suntayahu Legese and Dinke Meseret have emerged winners of the male and female events of the 2018 Access Bank Lagos City Marathon. Legese triumphed in a time of 02:17:28hrs ahead of Kenyans Joshua Kipkorir (02:18:16hrs) and William Yegon (02:19:04hrs), who placed second and third respectively at the IAAF-sanctioned event. Nigerian Sunday Manasa, who ended the race in sixth place in 02:21:11hrs, was the country’s best male performer. In the female event, Ethiopians Alemnesh Herepa (02:49:05hrs) and Kebena Chala (02:49:09hrs) were second and third respectively behind Meseret, to ensure a clean sweep for the East Africans. Meseret was champion in 02:48:02hrs. Sixth-place Deborah Pam (02:52:59hrs) was Nigeria’s best performer in the female event.